This is the second of the posts in our (Emily and Robynn) series for the Pay it Forward design school. There are several different resources for creating knitting charts, but the two main options for charting specific software are Envisioknit and Stitchmastery. I use Stitchmastery rather than Envisioknit because it is available for a Mac operating system, but in discussions on the Designers forum on Ravelry there are lots of people recommending either. Both programmes allow for drawing charts, customisation and, crucially for me, automatically generating instructions to accompany the charts. That said, the main source of my loyalty to StitchMastery is the excellent support available to users – there is a wonderfully informative blog and an active Ravelry group for any questions, and any time I’ve needed to email I have received a really quick an informative response (including things like, Help! I seem to have lost my activation key in a computer update). If your main concern is to have full control over the appearance of a chart, or crucially if you want to draw a crochet chart, then using a graphics programme such as Illustrator or InDesign is your best option. There is obviously a steep learning curve involved, and you will need to either use a knitting specific font or create your own symbols for the different stitches, but this allows you full customisation over the appearance of your graphics. To create charts using software that you already own, Excel (or Numbers) are also reasonable options, especially if you combine it with a knitting specific font for the various symbols (the one that I know of is available from Stitchmastery). To my mind the main drawback of both these options is that no written instructions are generated, and if you are making a large or complicated chart then creating those from scratch will take a significant amount of time. There are also several free options for generating charts available on the internet, the most interesting of which is Stitchmaps. This allows you to see the shaping effect of the stitches you are using, as they are not constrained to a square grid – I often use it to check how things are going to line up after I have charted something in another programme, though I find the charts hard to knit from. Bear in mind that while you can draw a chart for free, a subscription is needed to export. The final option is to pay a tech editor to generate the chart for you, which is probably not as expensive as you might imagine. However, to then have that chart checked it might be necessary to go to a second editor, as it is difficult to check your own work. More resources for other programmes. 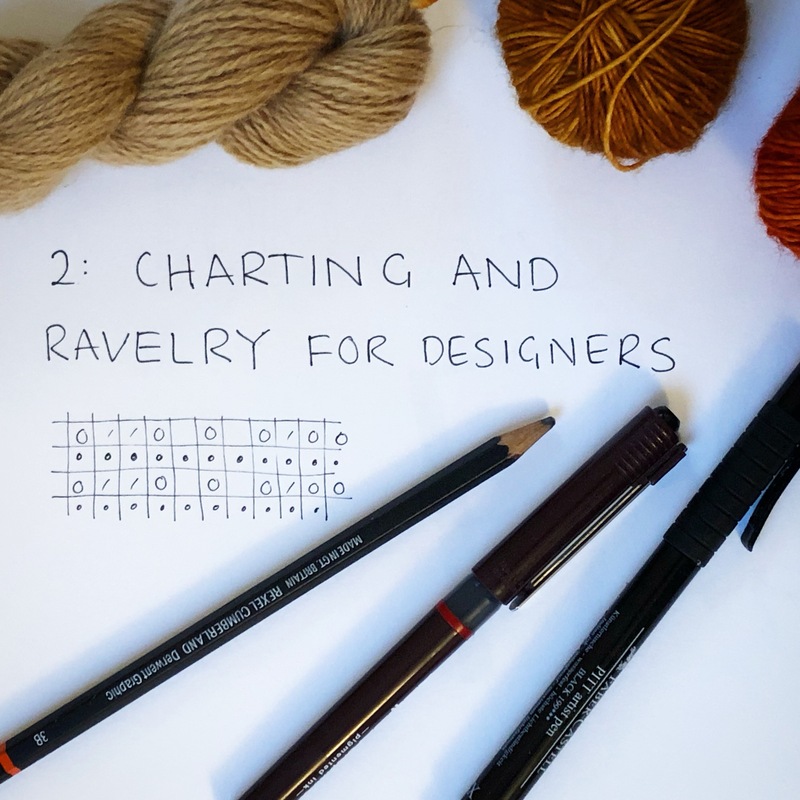 Create a full electronic chart for each stitch or colourwork pattern in your design (or if you don’t need a chart for your design, chose a pattern to chart and have a play!). Make sure that the chart clearly shows the repeat (by stitches and rows) and that every increase and decrease is accounted for. Play with the appearance of the chart – you can change the font and the size of the text, maybe re-arrange the key. Check the written directions – are there any changes you want to make? One of the really powerful features of stitchmastery is the ability to create your own stylesheet to customise how these instructions work. Export both the chart and written instructions. Join the Stitchmastery Ravelry Group and read through some of the conversations there. If don’t have access to Stitchmastery use another one of the programmes listed above to generate a chart. Make sure that the chart clearly shows the repeat (by stitches and rows) and that every increase and decrease is accounted for. That is, do the stitch counts work out? Does each row consume the correct number of stitches resulting from the previous row? If the stitch count changes from row to row, is that clearly shown? Write the pattern out in words and check the same thing – is every stitch accounted for? Write out any changes in stitch count at the end of each row. If you’ve done the wording manually, then if possible, enlist a friend to help you check the chart against the written instructions – read out each row of the chart to them while they follow the wording, to be sure they match up. Ravelry is an astonishingly rich resource and if you don’t use it, you are cutting yourself off from a wealth of knowledge, data and support. Now why would you do that?! Let’s take a whirlwind tour of the main features – with a designer’s perspective. Probably you know a lot of this already but since everyone uses Rav differently, I’m assuming nothing. This is my (Robynn’s) Ravelry home page. It’s not the home page (what you’d see if you click on the icon, top left) – that would show you the Rav blog, and some helpful links for newbies; but I point my bookmark to the forums, and specifically to these groups, because these are the discussions I like to keep tabs on every time I check in. You might notice that none of them are the “Big 7” forums that every Raveller belongs to as default. Those are great, but I don’t need to watch them regularly (and honestly… because they’re so active, they can be pretty distracting). I belong to a large number of groups and I’ve arranged them in five different tabs, but these are the most important ones. Top left is the group I co-host with Emily, to discuss our designs. It’s not the most active, but it is friendly and most important, it’s a really useful space to announce new releases, run tests and so on. Then Designers and Budding Designers are the super-valuable groups we keep harping on about, and below I’ll show you some of the reasons why. The other groups you see there are useful for keeping an eye on new Rav developments and such, and below that (out of screenshot) I have some of my favourite social groups. I could easily rabbit on for ages about the forums, but will try to focus on the key points. First: use the groups. There are groups for so many special interests – everything from Harry Potter to local knitting groups (or shops) to dyers and designers to parenting or feminism to particular styles of knitting… Finding a group you feel at home in can be a deeply wonderful experience, but as a designer, the main thing is to get to know groups that are relevant to your designs. For instance, groups for shawl lovers, or colourwork. Those groups can be a rich source of market research, not to mention sales. But here’s the second point: don’t be gross. As indie designers, we are incredibly lucky to have a community of customers who are genuinely eager to learn about our work, but nobody appreciates a hard sell – especially coming from someone who doesn’t participate in chat but just jumps in among a bunch of strangers to push their patterns. We’ll talk more about appropriate behaviour much later on, in the marketing topic, but basically, just remember to be considerate. Join groups to get to know what your customers want, and maybe to chat with them; promote your designs there using targeted ads, and (depending on the group’s rules) to announce new patterns in the appropriate thread. Don’t be pushy. But do take the time to find your audience. And definitely take the time to get to know the two designers groups. Both are welcoming and supportive, full of detailed information and advice, but for a newbie, BD is definitely the better one to ask questions in. Spend some time browsing the archives (and resource pages) in both, though. You’ll learn a lot. One thing to bear in mind: both groups are home to plenty of non-designer lurkers – people who enjoy hearing about what designers do behind the scenes, without wanting to design themselves. This is great, because they occasionally pipe up to give a customer’s perspective (so helpful! ), and because they follow the monthly New Designs threads. But remember they’re reading, and consider how you want to present yourself. Note the two ringed links in the above screenshot – patterns, and “my designs”. Besides the groups, those are core features to understand. Ravelry’s complex, user-generated database of yarns, patterns and projects is enormously powerful and enormously valuable to anyone in the industry, because of the interconnections between those elements. As a casual user, you can search for project ideas by checking what others have made with the yarn in your stash; or what yarns have been used to make that pattern you’re eyeing up; or you can look at FOs for a particular design to see how it looks on a body closer to your own shape than the model’s. For designers, all of those uses are great, but you need to particularly understand the pattern database. The pattern database can also be viewed in order of recent popularity, or the (in)famous “Hot Right Now” pages. Visit this page with care: it can be demoralising, if you feel it’s being dominated by a particular aesthetic and a handful of top designers; and it’s easy to get sucked into checking where your newest release is on that list. (The flurry of activity that goes with a launch often pushes new patterns up the rankings for a day or two.) HRN isn’t necessarily a good indication of a pattern’s success in the long run. But it is interesting to view as a trend snapshot – and I find it helpful as inspiration for pattern styling.